Are you crushing on the idea of going angling this season to grab trophy size musky? The fish is violent and is not easy to grab hold of unless you use proper tools and techniques. One of the most important requirements for musky fishing is getting hold of best musky lures. 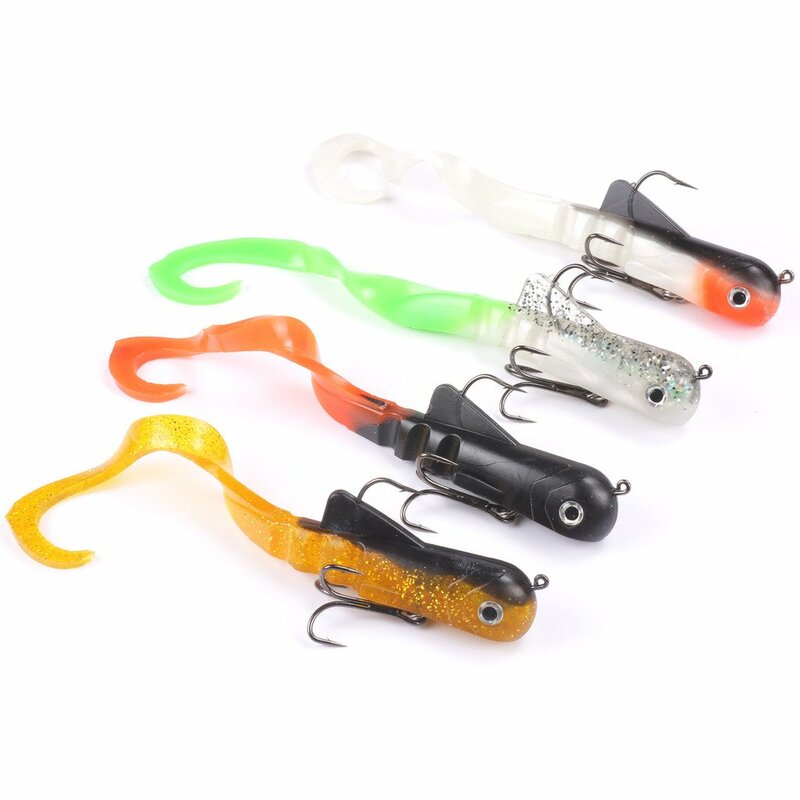 There are many lures available in the market but what you need is something that works well with motion, has realistic look and swimming motion and presents itself with slow action. It is a daunting task at times to find the best lures but this comprehensive guide will help you make the best selection. All the lures listed here are attractive and specifically designed for Muskies, tested and tried by musky fishermen. 2 What Makes A Muskie Lure Great? The design, pattern and convenience of muskie lures have changed and evolved with time and now most of them are for better fishing tactics. The musky lures nowadays mimic natural baits in water attracting fishes with slow presentation. Here are types of lures that are great for catching muskie and are popular amongst fishermen. Spinner Muskie Lures – They are one of the most popular and widely used muskie lures that come in colorful blends and co-ordination. 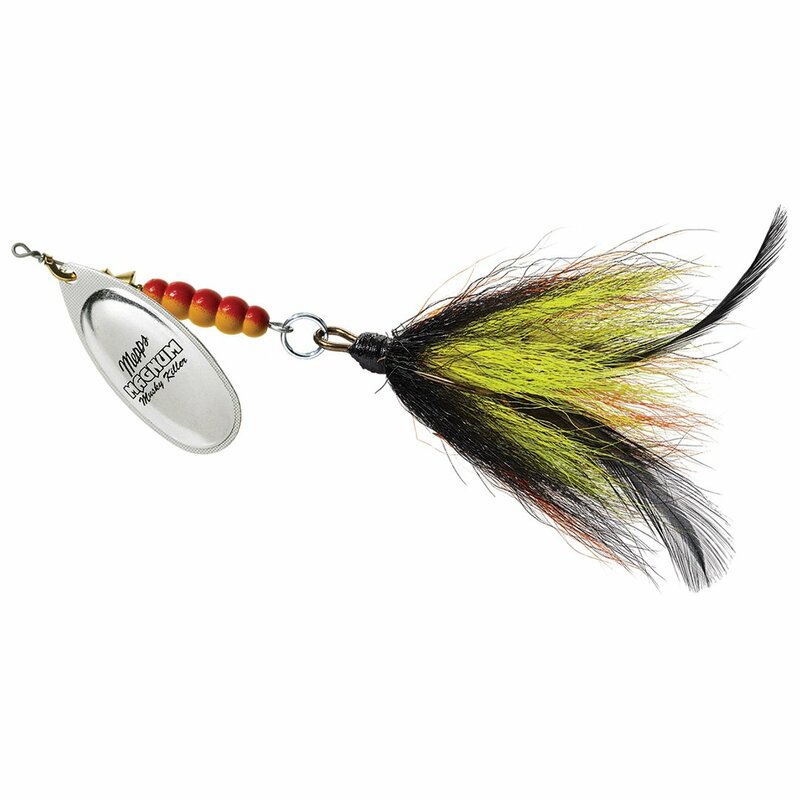 It has spinner blade that is extended from its hook with a feathery skirt made of bucktail. The spinner blade rotates and at times causes the line twist and may be a little problem while muskie fishing. It can be minimized by using snap swivels between line and musky lure. Jerkbait Musky Lures – They are perfect baits and have been used since a long time. The jerk baits are strong, sturdy and slender lures showing erratic movement like that of injured fish. It is easy to use such lures and with application of quick jerks, it is possible to retrieve the fish. The jerk bait creates noise like that of injured fish that attracts its prey. Live Bait Muskie Lure – It is one of the oldest forms of muskie lures used but now they are more or less replaced by synthetic lures. The live baits are expensive and it is difficult to keep them fresh and alive for a long time. It is required that the baits are kept in oxygenated water for better conditions. The live baits are hardly used nowadays as synthetic real like baits and lures are easily available. MudPuppy Lures – Trout is something that is loved by Muskies and anything that resembles trout is expected to attract the musky. Older lures were given the shape of fishes like mud puppy, trout or salamander with treble hooks attached along the length. They tend to attract the Muskies but usually the violent action of Muskies results in losing of fishes. What Makes A Muskie Lure Great? There are certain features of lures that make them special and great for musky fishing. Musky is a violent and big fish which requires the lures to be designed accordingly. The lures should have great body resolution that looks like real fish. It must mimic action and swimming motion of real fishes to attract more Muskies. The treble hooks should be heavy duty and strong so that it holds the fish firmly and does not fall for its attack. The construction of the lure must be sturdy and strong so that it can be used for more number of times. The length of the lure should be proper around 8 inches so that it can be used comfortably with slow motion. The 8 inch 8 segment lures are perfect for attracting and catching musky fishes and is favorite amongst anglers. 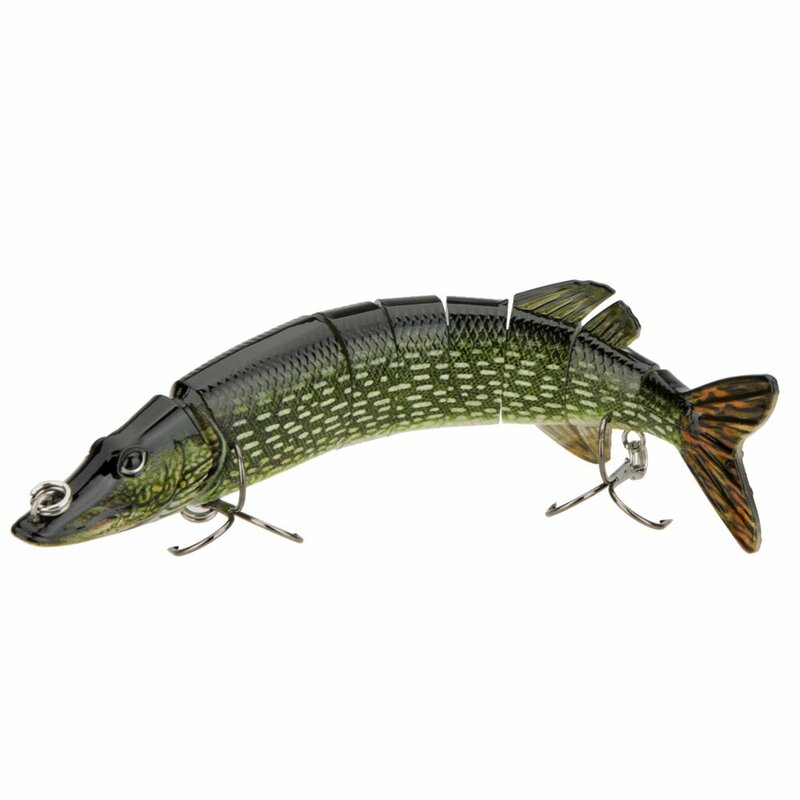 They look life like northern pikes and tiger muskie has 3D detailed eyes, perfect detailed body resolution and realistic look. The multi-jointed lures of 8” are made of hard plastic with two strong treble hooks on both ends. With real swimming motion and action, they tend to attract Muskies and get them trapped. The musky lure is basically designed to handle and catch larger fishes. The blend of spinner brass blade along with feathery frills makes it a great product. It is one of the best bucktail lures and is mostly used by professional muskie and pike fishermen. The lure comes with flexible features like east to change bucktail. With inclusion of #7 brass blade great flash is provided and the treble hook is a heavy duty VCM 5/0 cone cut version. It is suitable for use basically in shallow conditions with its maximum depth limit to 8 inches deep. The Mizugiwa lures are soft bodied lures available in pack of four and using them gives life like action. They are soft bodied but powerful enough to catch large fishes like pikes and Muskies. The lures are 7 to 8 inches in length with a long stretched out tail and each of the lures weighs only 45 grams. They are flexible cast to cast type of bait. The realistic like appearance comes with real like swimming motion and is slow sinking in nature. The unique and innovative muskie lures combine the sharp spinner blade with feathery climb on the extension making it irresistible for the baits. It is a great lure for shallow and weedy water which slowly starts its action. 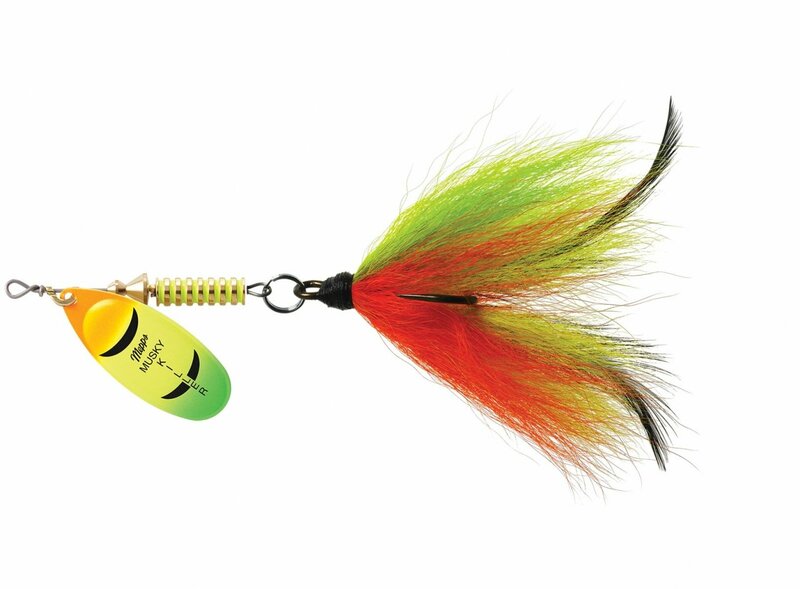 The action of the spinner blade is presented slowly attracting muskie from deep warm waters. It is a great lure and is preferred by most of the seasoned fishermen for its high performance. Musky fishing is one of the favorites amongst angler and for the prized size of the musky, proper lures is needed. The market is flooded with different musky lures and baits but only a handful of them are good. It is important to read reviews and find the effectiveness of the lures before spending on them. It is a daunting task to choose the best amongst wide range of available products but this comprehensive guide will help you with the solution. The reviews along with pros and cons of the three best musky lures are decided after practically trying and using different lures. The reviews are compiled after being tested by experts. If you are preparing to set on some large fish hunting, do read the guide and purchase the right kind of lures for best effect.